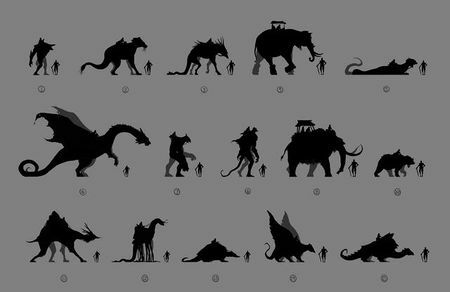 Mobs, Bosses and Dragons Concept art. Dragons are royal mounts capable of true flight. They are available to Mayors of metropolis nodes and Kings and Queens of Guild castles. Dragon eggs can also drop from epic and world bosses. These will be temporary mounts that will exist for a limited duration. Dragons are epic flying mounts with strong battle abilities, such as AoE breath attacks, swooping flyby attacks, and others. Dragons have PvP capabilities relating to Castle sieges and Node sieges. Certain mounts will have combat abilities. Players can't use their class skills while mounted. Mounts can be killed by players, but can be resurrected. Dragon appearances are based on the region of their origin. Royal mounts are a class of mounts available to Mayors of metropolis nodes and Kings and Queens of Guild castles. Royal mounts can also be dropped from legendary world bosses. If dropped from World bosses, royal mounts will have a life-span likely between two weeks and four weeks, after which the mounts will pass away. Each server will likely have a dozen or so flying battle mounts at any given time. There are different types of royal mounts. Other types of legendary, mythical creatures. The maximum flight time on a royal mount is probably limited between 20 and 30 minutes. This will limit the range of effectiveness for these mounts. Royal stables are a type of building present in castles and that can be elected to be built within nodes. ↑ 1.00 1.01 1.02 1.03 1.04 1.05 1.06 1.07 1.08 1.09 1.10 1.11 1.12 1.13 Livestream, 8 April 2018 (PM) (51:49). ↑ 2.0 2.1 2.2 Livestream, 26 May 2017 (37:17). ↑ 7.0 7.1 Livestream, 5 May 2017 (22:44). ↑ Livestream, 5 May 2017 (38:27). This page's content was last modified on 14 February 2019, at 19:35.